(aka loo paper in this corner of the world). This time I decided to limit the amount of colour I used, which proved difficult. No matter how much care I took, the ink seemed to splatter out of it's bounds - I eventually managed a reasonable impression, but I guess that is the risk one takes when playing with ink and water. I added a die cut butterfly, with a drop of clear Kindy Glitz on it, to one corner of the embossed paper. The damp loo paper embossed beautifully with all the layers I used this time - I know it was somewhere up in the 20's for this impression. The sentiment was stamped and embossed, using the same die ink (Memento Tangelo) and Versamark ink, and clear ep. For added interest I layered the white card over a stitched die cut circle, placed it over the corner of the card, and then trimmed it to the edges of the card. I am pleased with how this card turned out. A fun and different card, and even I´ve heard of this toiletpaper cards it´s the first time, I´ve actually seen one, but it looked pretty good thinking of how it´s made. I don´t dare think of, what it would´ve looked like, if I had tryed anything like this he he. Thanks sooo much for joining the challenge here at Card and Scrap. Ooh, that's really clever. I don't think I've seen that before but it gives an intersting effect. Love the way you've used the colour here. lovely kort, thanks for play with us at card and scrap. This is really cool looking and I love the bursts of orange especially in that butterfly. It looks like regular paper from the photo but I'll bet it makes you wonder what it is in real life. Lovely embossed design, Maxine. Of course, orange is one of my favorite colors! Beautiful background! And the subtile use of colour looks so good! Enjoy your sunday! Love the embossing, so deep and clear. This is so tropical and exotic, Maxine. The embossing folder matches the nestie with the sentiment on it. Nice card you have created! 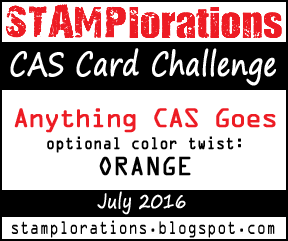 Thank you for participating in the summerchallenge at Cardandscrap! Wow! Such a creative card. I've never heard of this technique suing Loo paper for your design. You should do a tutorial on it. Great job. Love all the texture and dimension on this! Who knew TP could look this good?! I love that folder and what you made with it is gorgeous Maxine! Happy new week! You did a beautiful job with this technique! I love the orange and added sentiment- awesome!!! Thanks for joining us at Card and Scrap. Look at you!!! You achieved wonderful detail in your "loo" paper! This is so fun!!!! I have never heard of this technique before, went back on your blog to read more about it, as I missed your first card with this technique. How fun! And your card turned out beautifully! This is so gorgeous!! The embossing looks amazing!! I love the beautiful colors!! Thanks so much for playing along at Scrapy Land!! I love the embossing Maxine. Your card is awesome! The paper is just perfect for embossing. Lovely card. Oh this color is amazing, Maxine. I always LOVE seeing your sweet cards. Thank you for sharing your talents, your stamping especially inspires me. I tried a new technique and posted a card on my blog today trying my hand at creating a texture background using Heavy Gesso. It was a lot of fun. I hope you will take a peek. Have a blessed day, Maxine!